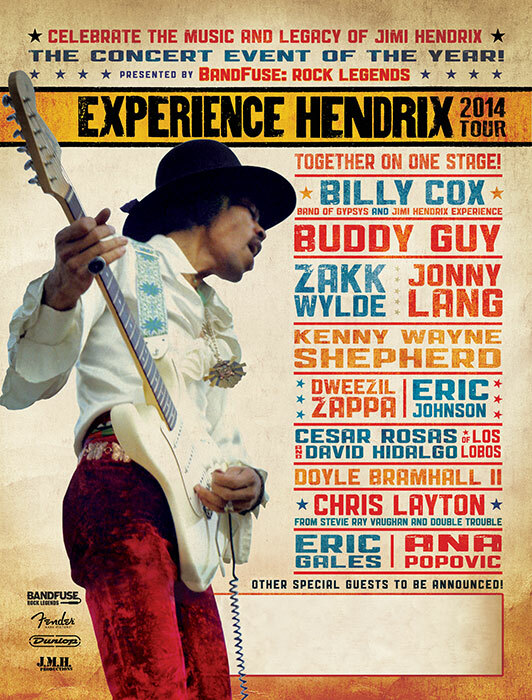 The eighth edition of the celebrated Experience Hendrix Tour is set to launch in March 2014. These special event performances represent an ongoing tribute to the music and legacy of Jimi Hendrix. Presented by BandFuse: Rock Legends, the month long tour, brings together a diverse group of musical greats paying homage to the abiding genius of Jimi Hendrix. This year's line-up ranges from metal legend Zakk Wylde [Ozzy Osbourne/Black Label Society], blues icon Buddy Guy, Jonny Lang, Kenny Wayne Shepherd, the innovative Dweezil Zappa, Los Lobos' stalwarts Cesar Rosas and David Hidalgo, left-handed blues rocker Eric Gales, Texas guitar gods Doyle Bramhall II and Eric Johnson, funk legend Bootsy Collins, Mato Nanji [Indigenous], and, from Serbia by way of Memphis, Ana Popovic. The rhythm section, as always, includes bassist Billy Cox, the only player, apart from Jimi Hendrix himself, who was part of both the Band of Gypsys and the Jimi Hendrix Experience and Chris Layton, the drummer who, along with the late Stevie Ray Vaughan, was a founder of Double Trouble. "BandFuse: Rock Legends will inspire the millions of Hendrix fans who truly appreciate his incredible artistry and talent, as well as introduce his genius to a new generation of budding musicians," said Jeff Marshall, Director of Artist Relations, Realta Entertainment. "Playable kiosks of the game will be at each of the shows, giving attendees a pick up and play, real rock experience with the only game that provides the tools to help become the next guitar legend." It's appropriate that BandFuse: Rock Legends is presenting the tour in light of it being named "The Best Music Video Game on the Market" by Guitar World Magazine. BandFuse: Rock Legends seamlessly connects real guitars, basses and microphones to game consoles, empowering players to jam using authentic animated tablature to a fully unlocked library of hit songs from rock to metal and punk to funk. Among the game's mentors are such noted artists as Zakk Wylde and Bootsy Collins who are performing on the Experience Hendrix Tour as well as Slash, George Lynch, Mike Ness, Alexi Laiho, Zoltan Bathory and Jason Hook. As in years past, Fender Guitars and Dunlop Manufacturing, whose gear is an integral part of the tour's backline, sponsor the Experience Hendrix Tour together with IK Multimedia and Hal Leonard. Janie Hendrix, President/CEO of Experience Hendrix L.L.C., noted, "Jimi often spoke of his concept of 'Electric Church' and using music to connect directly with people. Everyday, we see how Jimi's musical legacy continues to transcend generational and cultural boundaries. It's our continuing mission to do all we can to celebrate what he's given us and to keep his music in the forefront: the Experience Hendrix tour does that with brilliant musicians who love Jimi, electrifying the stage with his music and sound." The tour officially begins in Dallas at the Verizon Theater on March 11 and, thereafter roars through the Midwest and mid-Atlantic regions with stops in St. Louis, Chicago, Milwaukee, Louisville, Pittsburgh, Washington and Detroit with more than 20 anticipated concert dates. In terms of format, the tour offers multiple opportunities for performers and audiences to witness unique collaborations among the participating artists such as Dweezil Zappa with Billy Cox, Buddy Guy with Jonny Lang, Zakk Wylde with Chris Layton and will highlight these artists and the others performing their favorite Hendrix signature songs including "Little Wing," "Fire," "Purple Haze," and "Voodoo Child (Slight Return)". As has been the case with previous Experience Hendrix outings, special guests are expected to sit in at many of the dates, making the concerts all that much more memorable for both new and veteran Hendrix fans. Past special guests have included Paul Rodgers, Joe Satriani, Hubert Sumlin, Steve Vai, Susan Tedeschi, Robert Randolph, Carlos Santana, Robby Krieger, and others. This year's Experience Hendrix Tour is the focus of the Jimi Hendrix Guitar Competition, which was just announced last week. The competition, backed by Sony Music's Legacy Recordings, IK Multimedia, Talenthouse along with Experience Hendrix, LLC offers entrants a chance to win a performing slot on one of the tour dates next year as well as a cash prize plus gear. Contestants are invited to submit a video of their performance of a Jimi Hendrix track with the winner selected by a team of judges including Janie Hendrix, producer/engineer Eddie Kramer, Guitar World editor Brad Tolinski and musician Dave Stewart. Billy Cox, the legendary bassist whose relationship with Jimi Hendrix and his music dates back to the early 1960s when the two met while serving in the U.S. Army's 101st Airborne Division. The two bonded over their love of music and would later work together backing R&B acts on the "chitlin' circuit." They reunited when Cox was recruited to be part of the Jimi Hendrix Band of as well as the ultimate iteration of the Jimi Hendrix Experience, performing at such landmark festivals as Woodstock and the Isle of Wight. Cox, who has been part of all previous Experience Hendrix tours, notes, "It's always a great thrill and honor for me to play Jimi's music for audiences now just as it was in the 1960s. The Experience Hendrix tours have shown how timeless this music really is and is just wonderful that we've continued to get an infusion of new, very enthusiastic artists to participate and are able to offer the most wide-ranging Jimi Hendrix-related repertoire possible." Apart, of course, from Billy Cox, Buddy Guy holds the distinction of having actually played with Jimi Hendrix. The two first met in 1967 and Guy remembers, "We became pretty close from that night on and every time I went through New York or somewhere he would show up and we would jam together. That's still kind of happening on the Experience Hendrix Tour." Dweezil Zappa commented, "I've always been a great admirer of Jimi Hendrix. My dad told me some great stories about playing with him. Jimi's ability to express himself so completely with an electric guitar is very inspiring to me. "There was an authentic expression of his personality in the music. And that rings true to every generation. He wasn't following trends. His playing was soulful and exciting and surprising." The tour's presence has been made known on national TV with Cesar Rosas and David Hidalgo performing classic Hendrix on The Tonight Show with Jay Leno; Jonny Lang on Jimmy Kimmel Live and Kenny Wayne Shepherd playing Jimi Hendrix's actual Woodstock guitar on Late Night with Jimmy Fallon. Massively popular with fans and critics alike, an earlier edition of the Experience Hendrix tour inspired Larry Rodgers of the Arizona Republic to rave, "It was encouraging to see fans of all ages, from teens to baby boomers who witnessed Hendrix's career launch firsthand, in the Mesa crowd. 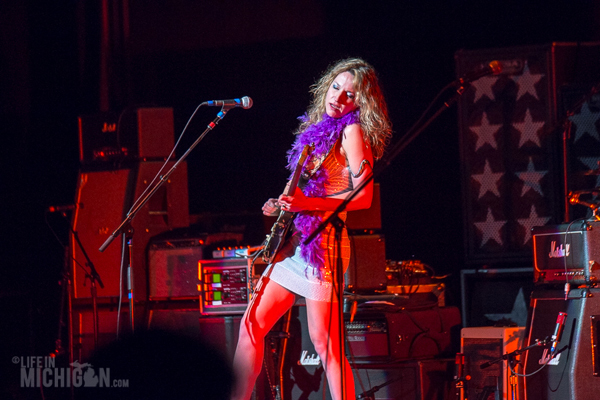 The show and that crowd made it clear that Hendrix's magical music will never die." Jeff Miers of Buffalo News wrote, "The nearly three-hour show moved from peak to peak, as varying configurations of musicians gathered to explore the Hendrix canon." Scott Mervis, in the Pittsburgh Post-Gazette, observed, "In the end, amidst all the star power on stage, the message reaffirmed in every lick, riff and warped melody was the wild and true genius of Jimi Hendrix."